We’ve just arrived in Savute. It’s the end of October, it’s HOT and we’ve just met Masters who will guide us through this area and later on to Khwai. We’ve also just learnt Masters’ best-kept secret for spotting game, except that he isn’t too concerned with keeping his trick in the bag. In the wide-open space of the Savute marsh we spent our time chasing wildebeest, watching elephants sleeping standing up against trees, a big male lion bending a branch under his chin for a pillow and wild dog collapsed in a mess of legs and ears under the closest shade they could find. The animals regarded us vaguely but didn’t bother stirring as our cameras clicked away. Despite the intense heat which kept most animals in the shade, we came across plenty of elephants butting their heads against trees, hippos yawning out twisted laughter and a herd of buffalo big enough to be counted at a thousand, give or take a few. “That’s my favourite animal’ said Masters ‘because with that one…eish…the buffalo doesn’t mock charge, so if he comes for you, it’s already too late!” The rest of our group had already heard these tales in Chobe, spending their first night on safari wide awake as buffalo entered the campsite and Masters’ tales repeated in their minds. On the road between Savuti and Khwai we watched green open spaces turn to long yellow grasses and closed-in mopane forest before stopping for tea in open grasslands of the Mababe Depression. The landscape was yellow and the sky a blazing blue that formed mirages on the horizon. “As soon as the rain starts, this place is green, green, green and full of thousands of zebra and wildebeest.” It was hard to imagine that we were only a few weeks away from a complete landscape change that would come with the first rains. Arriving in Khwai, Masters found us seven lions under a tree, across the road from two signs pointing in opposite directions. 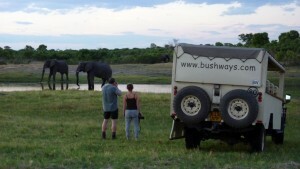 “Welcome to Chobe” on the left and “Moremi Game Reserve – 20kms” on the right with no fences in between to impede the animals’ movements. Just as we’d thought we were done for the night, a civet ran across the road in a spotted blur and we arrived back at our campsite to find our tents made up, our showers ready and food almost on the table. Over dinner we discussed food, “I don’t understand how you foreigners each so much’ Masters said piling the mayonnaise on his dinner ‘if we do that, we get fat.” We tried to protest that people don’t normally eat us much as they do on safari, but he cut us off, ‘did you eat your mayonnaise? If we don’t see anything tomorrow, you know who to blame!” By now, Masters has made his point and everyone around the table takes a spoonful. 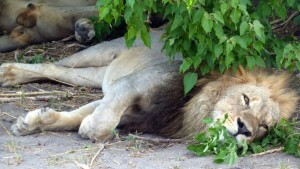 The next day we see the hyenas again, sleeping under bushes as vultures move in on the baby elephant. In the daylight we can see the tiny protrusions of the elephant’s milk tusks from the skull. 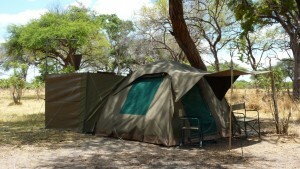 We see waterbuck, giraffe, zebra, red lechwe, hippos, warthog, Egyptian geese, bateleur eagles and saddle-billed storks. We stop for a mokoro excursion in the afternoon and everyone comes back with water lily necklaces and hats. That night we see the spotted hyena again, munching on baby elephant for the second night in a row. On our last night we’re a little sad to think it’s back to the real world where we don’t find ourselves in the middle of herds of antelope, elephant, wildebeest and buffalo every day. 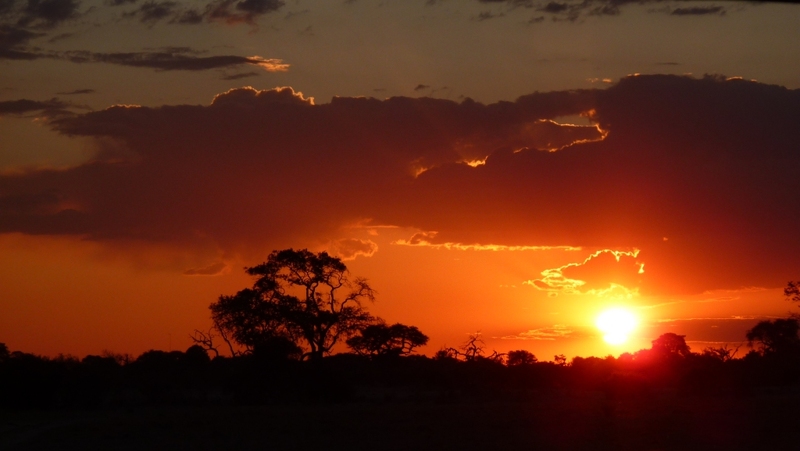 We hear hyena calling in the night and lions roaring close by in the morning. We’re all excited over breakfast, hoping to catch the lions before we leave. The lioness round up their cubs and take them to the narrowest part of the river, belly-flopping into the water and beginning to paddle. Very soon, all nine are treading over to the other side. We’re feeling a bit inspired and all cheer ‘mayonnaise!’ as the lions emerge looking soggy and worried before disappearing into the Moremi Game Reserve on the other side of the Khwai River. A moment later we’re also on the road out of Khwai, heading back to the real world on the calcrete road to Maun. 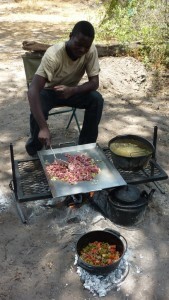 Combine with: Victoria Falls and the Okavango Delta on our 10N Authentic Lodge & Mobile with optional extension to Meno a Kwena on the Boteti River/Makgadikgadi NP. Access: from Maun or Kasane/Vic Falls or Livingstone with Northbound and Southbound departures throughout the year. Have you also read one of those before and wondered? 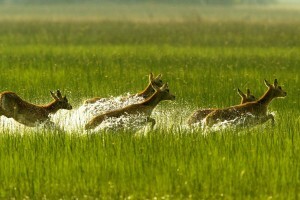 The Okavango Delta is a very unique part of the world. Looking at a satellite image you can easily see a few blue lines meandering from the Angolan highlands all the way to Botswana, forming a magnificent river that spreads into an alluvial fan and then simply disappears. It creates an amazing oasis in the middle of the World’s biggest stretch of sand, the Kalahari, reaching from Congo to South Africa. Magic. But the true magic is in the timing of the flood! Rainy season in the catchment area and around the Okavango usually begins in November, with the majority of rain falling in January and February. The local rainfall only contributes to between 2 and 25% of the delta waters, the majority of water is coming down from the Angolan highlands. If we traveled with a little drop of water from the source of one of the main contributories, the Cubango and Cuito River in Angola, the start of our journey would be quite exciting, through the Angolan highlands and then down to Botswana, but even before we’d cross over the border we’d already travel at a rather leisurely pace simply due to the lack of gradient. It takes this little drop of water average 8-9 weeks to reach Botswana and the panhandle of the Okavango Delta. From here onwards the journey slows down even more: the Northern part of the Okavango is 250km away from the Thamalakane fault line – the delta’s Southern border – but there is only a difference of 50 meters in altitude! The main waters reach Botswana in April and start to spread throughout the alluvial fan slowly filling up the channels, backflows and floodplains, with the delta being at its fullest in July/August. From August onwards the water levels start going down again due to evapotranspiration now exceeding the input by rain waters. The driest period in the delta is in October and November, when food is scarce and animals are found around the remaining water sources and rivers. Many channels have dried up, avid birders can’t get enough of all the bird life gathering around fish traps as the water keeps receding and cars can be used where just a few months ago boats were necessary to get around. Just then the first rains fall again, the shades of brown start turning into shades of green once more, impala and other antilope drop their young and the cycle starts over – the Okavango becoming a place of plenty. The water levels in the heart of the delta though will only rise significantly once the rains have long gone. So what does this mean for us selling the destination? This region is highly dynamic. Each year presents a varying amount of flood water in winter and a varying amount of rain falls in summer. Being nature, this provides a certain amount of unpredictability and nobody knows what will happen from one year to the next. 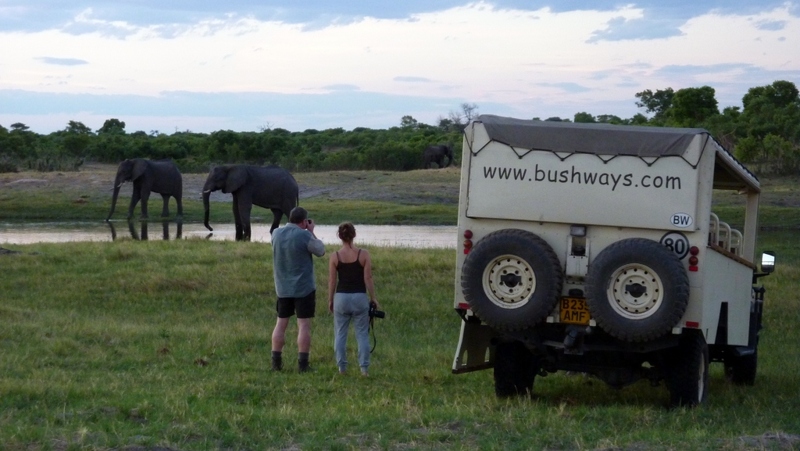 A well rounded Botswana Safari consists of game drives in drier areas and also water activities, be it by boat or mokoro. Mekoro are ideal to travel over floodplains in shallow water, gliding through reeds, discovering the little hidden gems of the area. Once the floodplains have fallen dry it becomes difficult to offer mokoro excursions due to safety concerns in deeper waters of permanent channels and rivers. Even if those deeper waters are actually not that deep anymore, they are considered prime real estate amongst hippos in not that great a mood as their territories are shrinking with the receding water and they are now very much up close and personal with their competitor and neighbor…. It is far easier on the nerves to observe those dynamics from a motor boat, but be aware that cruises can be a lot shorter due to a lack of either depth or river altogether! Eagle Island Camp for example, a camp that often has been sold as typical water-based delta experience, may not be able to offer mokoro during very low flood levels. The camps shift their focus. The floodplains may not be ideal for mokoro anymore, but they provide wonderful grazing for herds of buffalo as around Duba Plains; around Jao Camp the floodplains fill up with big herds of lechwe, enjoying the greenery. Other camps might not be that heavily affected and still happily take their guests on mokoro excursions and motor boat activities. 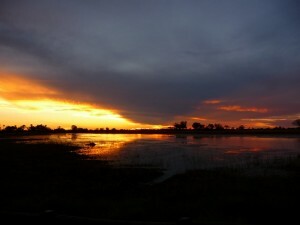 Here in Maun the flood levels of the Okavango Delta are an everyday topic and we never get tired of it. When did “the wave” come past Nxamaseri, has the water already moved towards Vumbura, when will it reach Sandibe… There is no end to it! The delta is a truly wild place, it is alive and offers mind-blowing experiences on land and water year round. For next year: Let’s just keep the waterlevels in mind and choose the camps that offer water-based activities wisely.